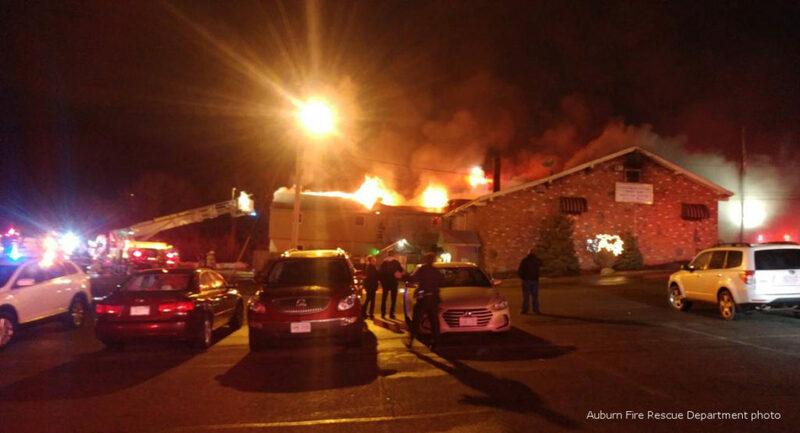 AUBURN — The Chester P. Tuttle American Legion Post 279 was destroyed by a three-alarm blaze on Friday evening as more than 200 people enjoying dinner within were safely evacuated. There were no injuries as a result of the fire. With the amount of people in the building at the time of the fire we are extremely lucky tonight that we did not have any serious injuries and that everyone was able to escape the building quickly. Auburn Fire Rescue Chief Stephen Coleman, Jr.
Auburn Fire Rescue Chief Stephen M. Coleman, Jr. said the attic was the originating location of the fire and was ablaze in advance of the first call for help. “The fire had been burning for some time in the attic space and was well advanced before anyone in the building knew it,” Coleman said. The initial evacuation of the diners and the order for firefighters to evacuate the building shortly before the roof collapsed helped ensure nobody was hurt as a result of the fire. 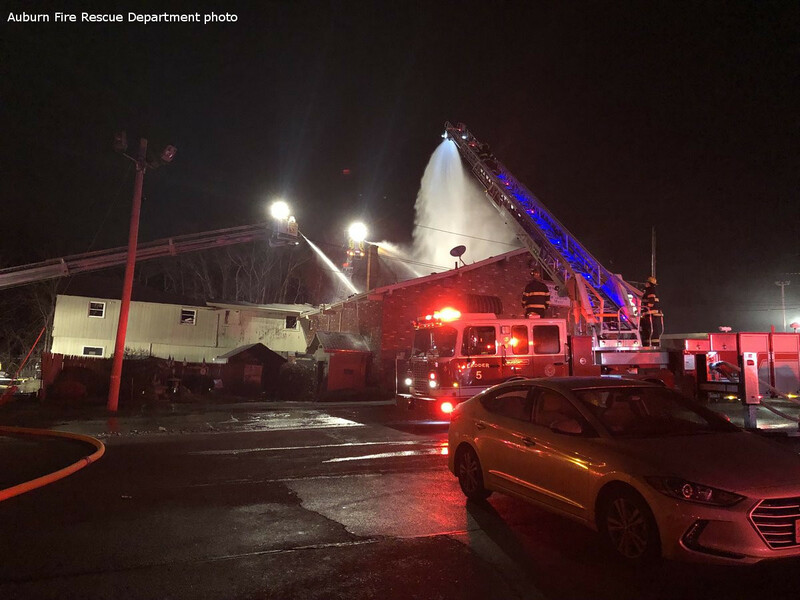 “With the amount of people in the building at the time of the fire we are extremely lucky tonight that we did not have any serious injuries and that everyone was able to escape the building quickly,” said Coleman. The fire is not considered suspicious but remains under investigation by the State Fire Marshal’s Office in conjunction with the District 7 Fire Investigation Unit. Mutual aid on scene included fire departments from the towns of Charlton, Leicester, Millbury, Oxford, Sturbridge, Webster, and the city of Worcester. The Chester P. Tuttle American Legion Post was established in 1922, named for a Needham-born man who was killed in France in the final weeks of World War I. According to property records, the Post on Bancroft Street featured more than 9,600 square feet on a 1.7 acre lot and was built in 1967.